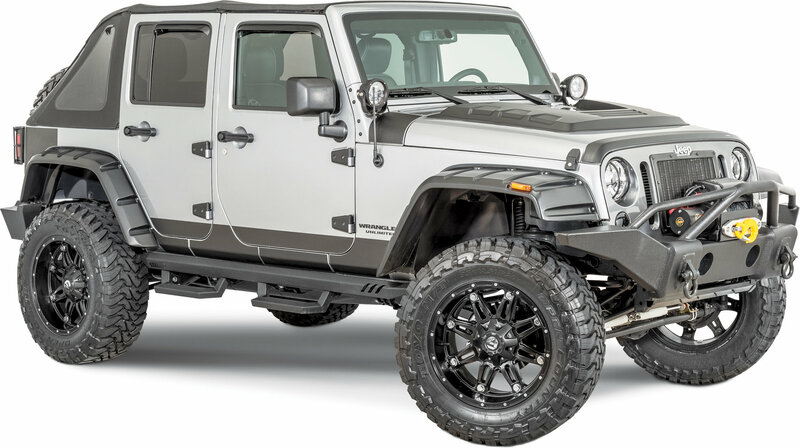 Rampage's RX-Rivet Style fender flares are the perfect addition to lifted Jeeps, giving them a bold, unmistakable appearance. Designed for larger tires and wheels, Rampage's RX-Rivet Style flares will transform your Jeep® into an off-road, gutsy-appearing ride. This rivet style fender flare provides extra coverage on trucks with larger wheel and tire packages. Update your vehicle with an awesome, wide-body look while shielding it from road debris. The extra height of the flares is also a great quick fix for covering rust and minor damages on the fender. Very disappointed and angry. These are very flimsy plastic. Tried to return them and found out it was going to cost 230.00 to ship them back. I guess I am stuck with them for now. I wouldn't recommend these to anyone and I find it hard to believe that a company would sell a fender this cheaply made for a Jeep.